In the medieval times, our modern emphasis on easy, speedy meals would’ve been an inconceivably foreign concept to a noble family. In my previous post on medieval food, I discussed the raw ingredients that comprised medieval cookery. The medieval baron liked a complicated and highly seasoned dish. (p.118). Much of this likely had to do with that fact that noble families, even those of minor nobility, almost always hosted dinner guests. Mealtimes were an important social affair – and hence an opportunity to display one’s wealth – that I’ll discuss more in the third and final post of this series on medieval food. 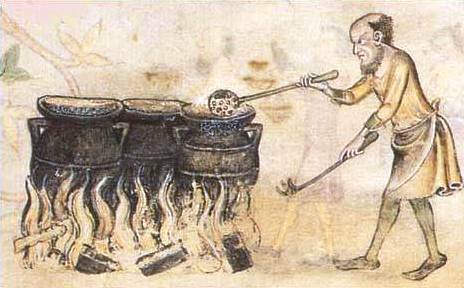 In and of itself, the actual methods of medieval cooking were fairly unsophisticated. 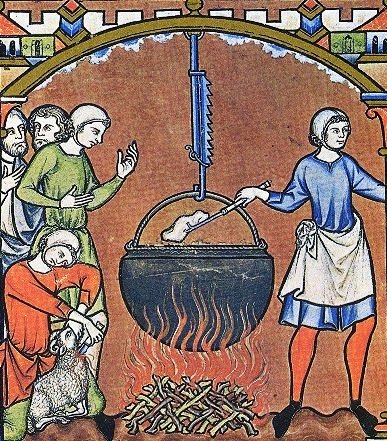 Meat was often roasted on a spit over the fire – usually turned by hand – but more commonly, the meat was simply boiled. This was done in either a three-legged pot that could sit directly in the fire or in a large cauldron that hung by a hook over the fire. Attached to the cauldron would be a chain that allowed the pot to be raised or lowered to regulate the temperature and cooking speed. Essential cooking utensils, meanwhile, included the meat hook – a long fork with a wooden handle and prongs on the side for lifting meat out of the pot; a long-handled, slotted spoon for stirring soup; a meat cleaver, and other large knives. To the tough, bland base ingredients discussed in the previous post, the cook of a noble family – according to Labarge, “frequently … short-tempered and overbearing” (p. 119) – would then add an astounding array of seasonings, spices, and seemingly incongruent flavours to make the taste buds come alive. Knowledge of recipes that were utilized in the 13th century come to us via what Labarge calls “the two most complete guides to medieval cookery” (p. 116): The Forme of Cury, which was the first English cookbook, compiled from recipes by the royal cooks of King Richard II, and The Goodman of Paris, a sort of lifestyle guide composed by a wealthy Parisian for his much younger wife. Although written at the end of the 14th century – during which diets were more varied and involved a greater number of vegetables – both books nonetheless contain many known recipes from the 13th century that changed little in the intervening time. A somewhat simple example is frumenty, describe by Labarge as “a gruel of hulled wheat, boiled with milk, and flavoured with various spices” (p. 82). To the modern palate, this sounds rather like a breakfast dish, but frumenty was instead regularly served as part of the evening meal, and was considered light fare in spite of the fact it called for 100 eggs for every eight pints of milk (apparently many medieval dishes called for a great many eggs, although Labarge theorizes they were very tiny due to poor diet of the hens). In the book, Life in a Medieval Castle, authors Joseph and Frances Gies describe the recipe for blankmanger (blancmange in French), which differs from the modern moulded dessert by the same name, instead including which included chicken pounded into a paste, mixed with rice cooked in almond milk, sweetened with sugar, boiled until thick like custard, and then garnished with fried almonds. 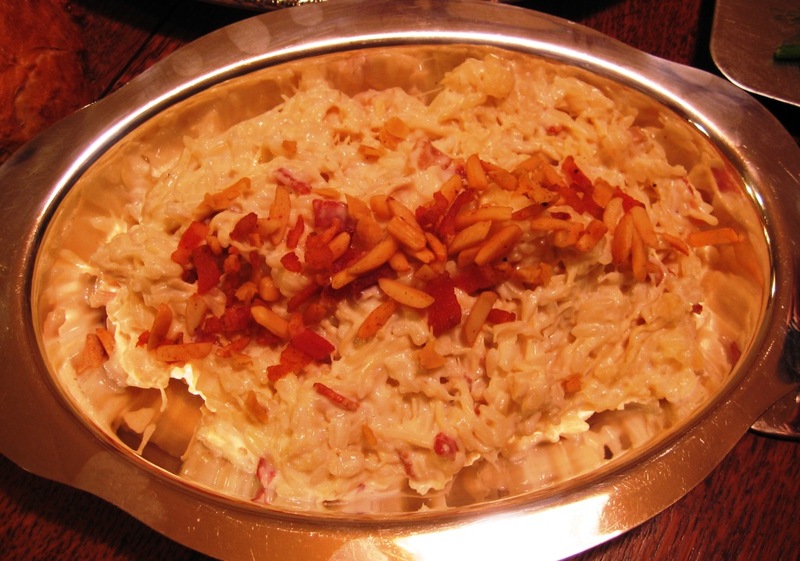 Another such recipe involving meat paste was mortrews – a sort of pâté of pounded meat or fish that was mixed with bread crumbs, stock, eggs, and “strong powder”. It was then poached and sprinkled with a “sweet powder“ of ginger, sugar, saffron, and salt. [T]he cook’s talent for cooking was important, although the Forme of Cury suggests that a strong right arm was an indispensable preliminary: practically all its recipes for meat, poultry, and fish begin with the sturdy admonition to “Smite hem to pecys”. (p.118). Meat and fish pies, pasties and fritters were also common. Although a dish could also be as simple as beans boiled in broth and served with bacon – a substantial dish for the poor (minus the bacon) – a wealthy family might yet seek to elevate the humble bean with onions and the highly expensive saffron to colour them yellow. Food was also turned different colours for the fun of it, the use of food as entertainment being a common feature of the more formal feasts and banquets. According to Marty Williams and Anne Echols, authors of Between Pit and Pedestal: Women in the Middle Ages, cooks designed very elaborate and ornamental dishes for these feasts. Besides the intentional use of herbs and spices to produce certain colours, each course would be ended with a soteltie (i.e. a “subtlety” or “subtility”: an ornamental design made in sugar; known in French as an entrement). Some simple examples include pastries or jelly desserts shaped like crowns, stags, or Saint George and the dragon. Medieval blogger/artist Rachel Grimmer writes that a soteltie might also be as elaborate as cooked birds re-dressed in their skins and feathers and made to make noise, or even more complex and impressive still. And that so too might the soteltie be linked to the non-edible entertainment between courses, thereby yielding a sort of medieval mixed-media performance art. Modern-day equivalents to this include wedding and birthday cakes, chocolate fountains, ice sculptures, and flowers carved from fruit. The medieval world has left behind more legacies to the modern world than just that, many of which I will explore as my monthly Medieval Mondays series continues. A/N: Next month will be my final post on medieval food, in which I’ll discuss the format and etiquette of mealtimes as well as how all this food-related research features in my WIP. This entry was posted in Building a History, Medieval Mondays, Writing and tagged 13th century, Historical fiction, History, I've suffered for my Art, Medieval food, Medieval times, Novel, Novel writing, Research, The Middle Ages. Bookmark the permalink.